Diffusion: At the beginning of the century this breed was the most widespread in the flocks of the Val Camonica-Region Lombardia, district of Brescia, Northern Italy-as many photos and oral witnesses confirm its presence. 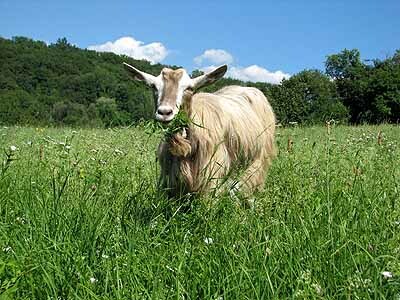 Today, the "Bionda" is still bred principally in this valley and as a whole there are 40 groups totaling almost 1,200 goats in Lombardia. 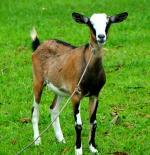 Breeding: The Bionda dell' Adamello is usually raised in small flocks of 15 to 20 animals. Milking, for cheese production, is carried out after kids weaning. In wintertime only-from November till March-animals are kept in barns, otherwise they graze in uplands for the rest of the year. Typical cheese Production: The "Fatuli" and the "Mascarpi" are two typical cheese produced with Bionda goat's milk. The first is smoked, the second is a whey-cheese. According to the official data from the Italian Goat Association, these goats are noted for producing around 350 kilos of milk with 3.2% of fats and 2.96% of proteins. In some management, milk production can reach 500 kilos. Standards: The hair is very long and its color is light brown, very fair, the ears are white as well as the second thighs under the hock and the knee, the inside of the thighs and the abdomen. This last characteristic makes this breed different from the other world widespread race, the Toggenburg. 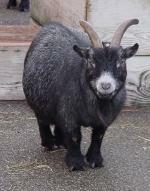 In order to belong to the Bionda dell' Adamello breed standard, the goat must have two parallel white strips on its snout. Event: The most important fair is held at Edolo-in the district of Brescia, Lombardia-during November. During the pageant apart from the animals, farmers show their typical valley products.